We have developed a proprietary AI-based food analysis engine and built an extensive food database of reference spectral scans. Third-party sensors can take advantage of Tellspec’s cloud-based spectroscopy solution by availing themselves of our extensive database or our powerful computational analysis. Our cloud-based systems can build upon our existing large collection of food data and scans to support vast data gathering on the quality and authenticity of the food scanned from all points in the food supply chain, from farm to fork. Our patented AI-based real-time cloud analysis can help monitor events of food fraud as well as of food contamination locally and in specific regions, thereby helping consumers and authorities to make choices to prevent the onset of health issues related to food. 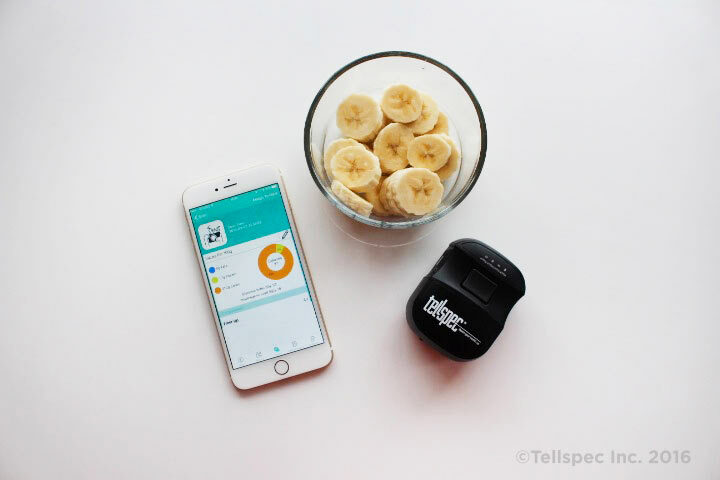 Tellspec’s Enterprise food sensor uses Texas Instruments’ DLP technology. This technology allows our scanner to have an excellent performance due to a higher signal to noise ratio as well as a more accurate spectrum acquisition. We believe that TI‘s DLP technology applied to spectroscopy brings amazing new opportunities for the exploding sensor industry, and we are proud to be working with Texas Instruments. Illumination Mode Reflective with two integrated tungsten halogen lamps. Battery Usage ~1200 scans from full charge to empty. Note: These specifications are subject to change during the development process. The handheld scanner incorporates a miniature near infrared spectrometer. The internal light source focuses a beam of light through the front window into the food. Light reflected from the sample is then collected through the same window. This light is then dispersed onto a micro-mirror device, and measured by an optimized detection system. This produces a digital electronic signal, known as a spectrum, characteristic of the composition of the food. Until recently, this type of analysis had to be performed in a laboratory with large and expensive equipment to get spectra of adequate quality. 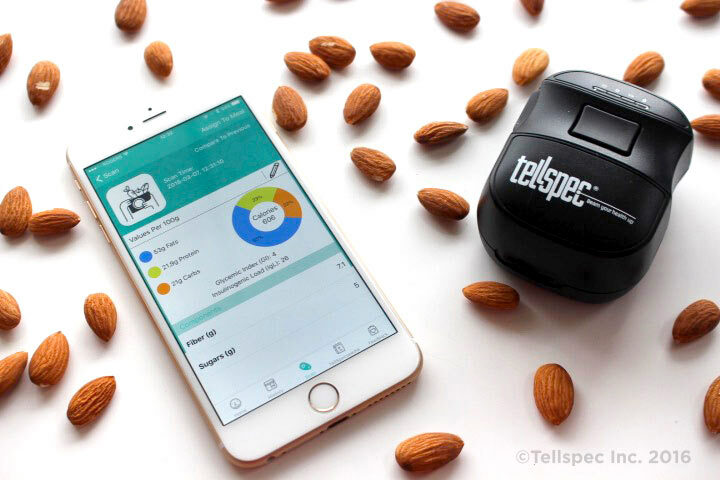 Tellspec has successfully worked on several versions sizes of the food sensor and is currently finalizing the miniaturization of the future Tellspec Food Sensor generation 1. The digitized spectrum of the food is transmitted wirelessly from the scanner to the Tellspec analysis engine in the cloud. Tellspec’s algorithms analyse the spectrum for information about the food, and send the results back to your phone for you to see. Our algorithms are based on machine learning, but we also use several bioinformatics techniques. The combination of machine learning, bioinformatics techniques and traditional spectroscopy gives Tellspec the ability to extract nutritional information from a spectrum, the unique fingerprint of the food.